I told you there was going to be more bacon. In fact, there's plenty of it. So much so, that I finally had to slice up what was left of my maple and savory bacon and give it to the freezer so my heart can have a respite from the goodness of it. I've told you I'm taking part in Charcutepalooza, if you don't know too much about it, give a read to my Maple Bacon Cheddar Scones post and that should fill you in. 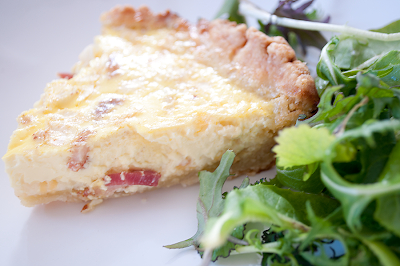 You could also make up the scones, this quiche, add a few side items and have yourself a fabulous bacon brunch! 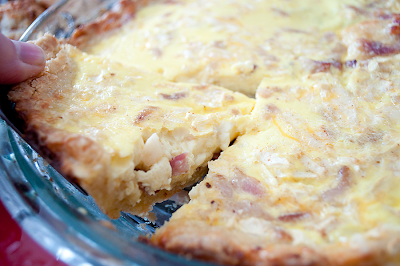 Quiche is a go-to dish in our house. There's always a pie crust, or at least the ingredients to make it, on hand. Eggs from one our several local farms are usually plentiful. Local and fresh vegetables are usually overflowing our produce bin. You can basically design a hearty weeknight dinner with a substantial quiche and a simple salad or soup on the side with very little. You know what we have a lot of? 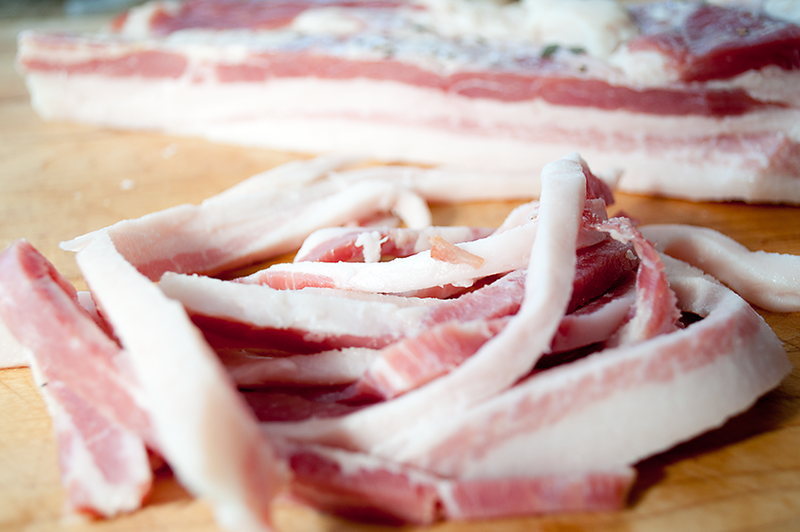 Homemade bacon. And parsnips from my Winter CSA from Heron Pond Farm in NH. So they are the stars in this simple winter weeknight quiche. Roll out your pie crust so it's large enough to drape over the sides, and fit into a 9-inch pie pan (you can use a fluted tart pan here too). Refrigerate for 30 minutes (it can be more as well). Take your eggs out of the fridge now as well so they can come up to room temperature. Line the pie crust with parchment paper (use parchment, wax burns) and fill with pie weights (or like me, use dried beans). Bake until crust is set about 12-14 minutes. Remove parchment paper and beans or weights, and pop crust back into the oven another 8-10 minutes until crust is golden brown. Take out of oven and leave out on a baking rack to cool. Leave your oven on. Now while your crust is baking up. Take your thin strips of bacon (homemade bacon is so pretty) and cook until crisp. Transfer to a paper-towel lined plate and set aside to cool. Once cool, chop into smaller pieces. Now in large bowl, take your eggs, yolks and half and half and beat it all up. Add the remaining ingredients (salt, pepper, nutmeg, cheddar, parsnip and finally, bacon) and whisk to make sure everything is combined. Pour mixture into your cooled pie crust. Bake until the custard is puffed, golden but still slightly wiggly in the center about 30-35 minutes. Take out of oven and allow to cool on a wire rack for a bit before serving. You had me at bacon! Love the title of your blog! Great message! Thanks so much for sharing your link on our Facebook page! I discovered the wonders and creativity of quiche when I was in high school, French class, and then I discovered bacon in quiche.... it was LOVE at first bite! I LOVE quiche and I LOVE bacon. This sounds pretty freakin' perfect to me!